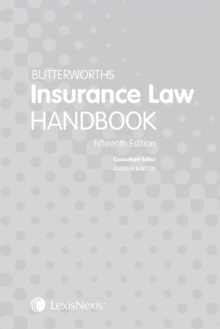 Butterworths Insurance Law Handbook provides lawyers and those involved in the insurance industry with an invaluable compilation of relevant statutes, statutory instruments, expanded FSA Handbook materials and European legislation applicable to this important area of law. Other useful information includes the rules relating to professional indemnity of solicitors, Association of British Insurers statements, guides and codes of practice and the Motor Insurers' Bureau agreements. The Handbook also covers Insurance Companies, Insurance Intermediaries, Insurance Premium Tax, with specialist insurance categories including Liability and Motor Insurance. The legislation is printed as currently in force (taking into account all amendments, repeals and revocations), with detailed technical annotations regarding commencement and cross-references to other legislation where necessary.